This image in Achill 24/7's gallery of Ireland pictures was taken from Minaun on Achill Island and shows Trawmore strand, Keel lake and Slievemore mountain. Trawmore strand, an EU Blue Flag beach, is Achill's longest beach at 3km. Keel lake, the largest of Achill's loughs and tarns, was a favoured fishing haunt for the American artist Robert Henri. 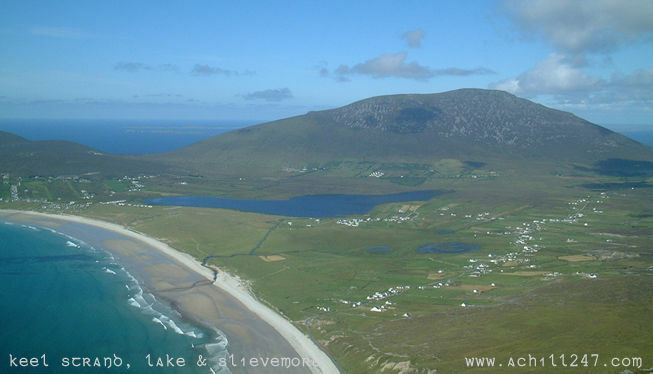 Slievemore is Achill Island's highest mountain at 672m. The ribbon of cottages and houses seen to the right in this picture is the village of Dookinelly, said to be the home of Fr Manus Sweeney, the priest hanged in Newport following the 1798 uprising. Further details of Fr Sweeney can be found in Gallery 3.